The Dawg Tree Pee Guard was created out of love for my trees and a little bit of frustration. As a dog lover and home owner, I tried everything to protect my trees. Having 4 dogs of my own, ranging in size from a Yorkie to a Malinois, and 3 dead trees later - something had to be done. The traditional tree guards were not effective, as the dogs would still jump over and accomplish their mission. I attempted wrapping my young trees with green bags to protect the base. If the wind blew, it became prey and I ended up with pieces of bag in my yard. Wrapping my tree with vinyl or utilizing a PVC Pipe wasn’t an option. I wanted the trunk to still receive sunlight, wind, and rain without worrying about insects/worms making a home underneath. The only real solution was creating a 360 degree barrier with a fence. I didn't want to have an eye sore in my yard, let alone a headache from mowing and trimming around the fence. Please visit my website to view videos of testimonials and how effective and easy it truly is. 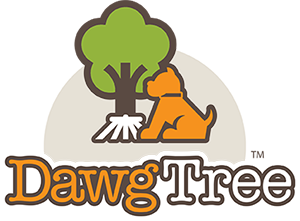 There are also links that will take you to scholarly documented articles that explain the damaging effects of canine urine on a tree. It still is very important to provide a healthy base of mulch around the tree and replace as needed. 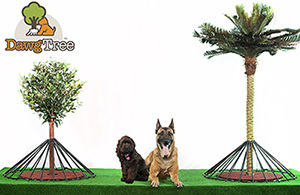 Even if you don’t have a dog but you have “those” neighbors – invest in a DAWG TREE PEE GUARD today – you won’t regret it. You can follow us on these social networks for product updates.